Tt eSPORTS is the brand that Thermaltake uses for their line of gaming accessories. 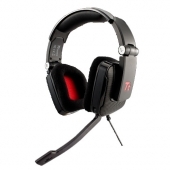 They produce accessories like gaming mice and keyboards along with gaming headsets and mouse pads. Thermaltake is known to make some pretty high quality products, so we will see if their gamer oriented division can live up to their standard. Today we will be looking at their Shock gaming headset. In our review of the Shock we will be looking at a few key areas. As this set of headphones is intended for games and not for audiophiles we will be testing and reviewing it from that standpoint. The Tt eSPORTS Shock is a mid to low end pair of headphones with a price tag of ~$50. A quick check of other gaming headsets on the market shows the average price is closer to $75 – $100 with high end sets placing closer to $200. The included features of the Shock place it in a higher category than its price tag would initially lead you to believe now lets see how they sound. Before we jump into that, lets take a closer look at the product and its packaging.